“The bad news is we don’t know what causes it or how to treat it successfully. But the good news is that there are now over 4,000 published studies that show underlying biological abnormalities in patients with this illness. I'm not the organiser of this weekly Twitter event, it is run by @MEawarenesshour, but there are many of us online every Wednesday night making some noise for the Millions Missing due to this condition, it is open to all. I hope you will consider joining us! Something most busy people wish: that they could stay in bed and not have to get up in the morning. Who doesn't love a lie in? But when you're living with chronic pain it becomes so hard to get comfortable and fall asleep. Even though many of us are housebound and forced to rest most days, there is nothing pleasant or relaxing about living with a chronic condition like ME/CFS. We don't only suffer from pain, but skin sensitivity and restlessness too. ME/CFS, when wearing a clean outfit is a luxury you cannot afford. I always used to struggle to find something to wear for work in the mornings, but since being housebound with ME/CFS, this hasn't been an issue. Getting dressed, like bathing, is exhausting! We don't concern ourselves daily with choosing a clean outfit, but many of us only occasionally wonder if it's still okay to be wearing the same outfit, waking and sleeping, after so many days have passed. The advice most often offered when people start feeling easily fatigued is that we should get out more and get some exercise, but this advice is detrimental to people with ME/CFS! Sadly even most doctors are unaware of the dangers of this advice and in prescribing extra activity to their patients, many friends and family will tend to agree with the doctors and encourage more activity too. We tend to have so much confidence in doctors, but they really are ill-equipped when it comes to treating ME/CFS. Many have admitted this openly, others are too proud or still believe old, debunked trials rather than the latest science. The fact that doctors and health care practitioners are not trained in caring for people with ME/CFS, and many have never heard of it, means that patients are often accused of acting or imagining their illness. The generic tests that are usually done by your doctor cannot pick up biomarkers for ME/CFS, it is diagnosed by process of elimination. So some doctors will tell you there is nothing wrong with you, despite the debilitating symptoms that such the life out of you. Once again, if the doctor says there is nothing wrong, family and friends often side with the doctor, so patients can feel very alone and isolated during the months and sometimes years leading up to a diagnosis. When I was working full-time, I had no time to continue some of my favourite hobbies like art, needlework, reading. I could barely fit in cooking and would cook just a couple of times a week in bulk. Now I have all the time in a day, but brain fog, pain and weakness as well as shaking often make it hard to do those things I now have time to do. Brain fog is particularly hard to deal with as it can make plain English seem like a foreign language. It can make you forget everyday words, have difficulty focusing, counting or even using everyday objects. Not only is is detrimental to do exercise in the common sense of the word, but simply standing upright or walking slowly in the house can cause massive reactions. My heart rate soars into cardio zone and my legs start burning and aching like they would if a healthy person were running a marathon. The type of muscle burn that comes from an intense workout. If I push through the burn, because I've only been up for about 3 minutes, the shakes set in. Athletes would recognise this symptom too as it comes from severe muscle fatigue and recovery is long and unpleasant. As you can see, when living with ME, every single movement has to be planned and executed carefully in order to save energy and strength as well as avoiding an increase in symptoms that could last hours or days. For people with ME/CFS, walking to the kitchen to get a glass of water, going to the toilet, getting dressed or brushing our teeth has the same effect on the body in terms of exhaustion and pain as when a healthy person does a strenuous workout or runs a race! I hope you have found this post informative and will consider sharing it so we can raise awareness and make some noise for the Millions Missing from their own lives due to the debilitating effects of this chronic illness. 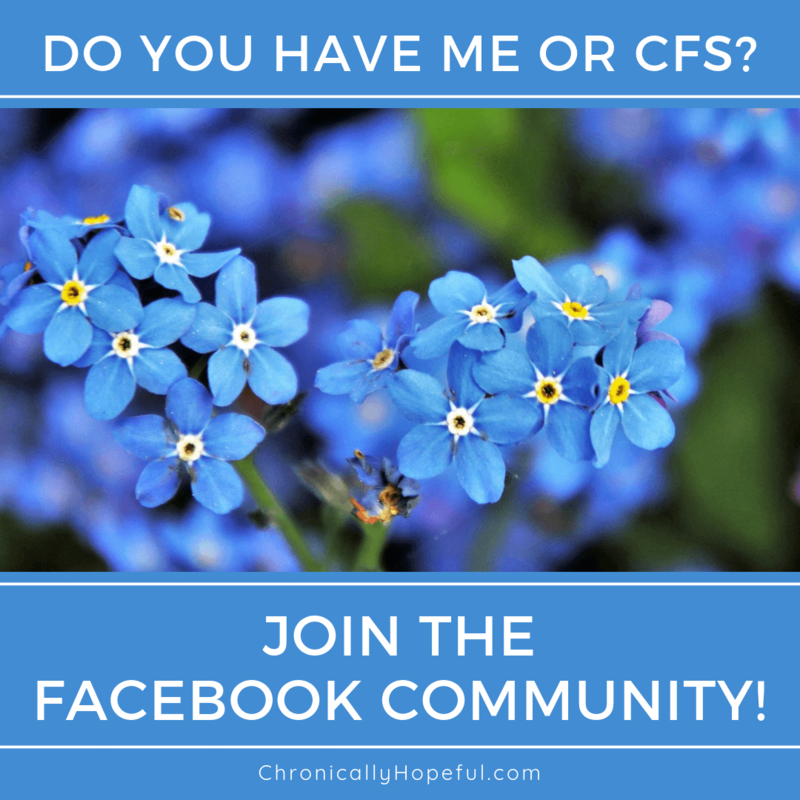 If you have ME/CFS, feel free to share your experiences in the comments below or as a guest author on my blog. If you have suggestions for memes I could make for future instalments of ME Awareness Hour, please contact me. Wow, this post describes my life to a “T”. All except the shakes and burning part. I was never diagnosed with ME/CFS, but only with Chronic Lyme Disease. There is very little difference, though. My pain Dr. did diagnose me with chronic pain syndrome. I have known many Lyme patients while receiving in-office PICC Line treatments. They all have generally the same symptoms. My daughter took me out to go shopping a week ago. We had so much fun, just being like two best friends giggling and looking for things on our lists! I was thankful to wake up to a good day, a day with more strength than usual. But after being out way too long, I knew I was borrowing spoons from the next few days at least! When she dropped me off at home, I left my purse in her car. “Well, we’ll just have to get together again! ” was both our reactions. We did get together again, a little over a week later, when she could get off from work. I woke up to a bad day that morning, but with having to return and/or exchange a few things, and then find some new shoes that didn’t hurt my feet, I was game for another shopping outing. My body was not. After the exchanges were made, the new shoes tried on and purchased, there was still one more store that we both needed something from. It was a big store. The kind you spend an hour in. I kept saying I was overtired, and she kept saying she was too. I know she was, but some how I don’t think she was close to the kind of fatigue I was talking about. After all, she still had to drive 40 minutes home after having dinner at our house and then deal with 2 teenagers and a husband. I had to take serious meds, drop in bed, and stay there. That was three days ago, and I am still burning with irrational fatigue. The kind that feels like it will never go away. And of course the pain, which never does go away. Ah that sounds like such fun! Sometimes the payback is totally worth it when you get to spend such great time with loved ones. I’ve had a few people recommend I get myself privately tested for Lyme. I am starting to really consider it. I will have to speak to my family and investigate it more so I know how to go about it. The thought of more needles and poking and prodding doesn’t appeal to me though. I’m terrified of needles, just the thought is making me weak! I hope you get to go out again soon and have an amazing time! My next outing will be later this month, to celebrate my sister’s birthday. I can’t wait! I’m going to copy the Twitter meme to my blog. Thanks for letting all of us know about this opportunity to increase awareness of this damn disease.